RadXmlHttpPanel may seem similar to RadAjaxPanel, yet there are some key difference this article will explain. 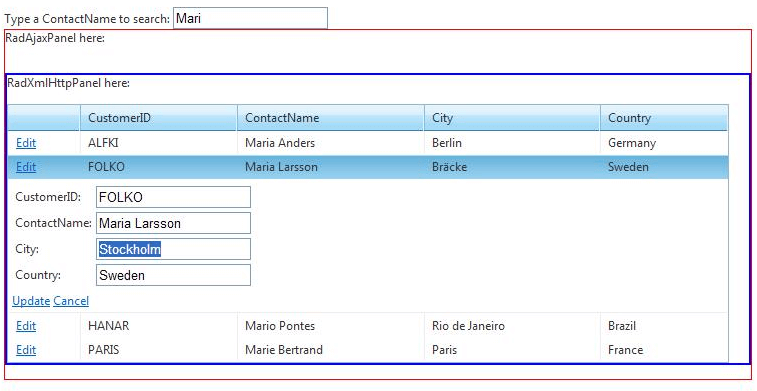 Telerik RadAjaxPanel, compared to the RadXmlHttpPanel, is more flexible and can be used in just about any scenario. This flexibility comes at a price – the page goes through its full page lifecycle. The whole control tree is created, all event handlers are executed, the ViewState is processed and updated, and sent back to the client. This makes the RadAjaxPanel very easy to use, and almost any control from the Telerik UI or ASP.NET AJAX controls can be hosted inside. The server-side event handlers (of the controls’ server-side events placed inside the panel) execute correctly and the affected controls are updated accordingly. This makes the RadAjaxPanel suitable to load dynamic page content, which requires server-side interactions and updates among the controls hosted inside the panel. Telerik RadXmlHttpPanel is a panel that can load content on demand, by using ASP.NET's Callback mechanisms and Web Services. Client callbacks and web services offer a performance gain over the AJAX partial updates, but cannot be used in many scenarios like AJAX. They do not offer ViewState and there is no page lifecycle. This prevents the server-side event handlers from execution and therefore the server-side interaction among the controls inside the panel is limited. This being said, the RadXmlHttpPanel is primarily intended to be used for loading presentation data. If any modifications or updates are to be performed on the content they should be done on the client-side. RadAjaxPanel can cover all scenarios, while RadXmlHttpPanel should be used mostly for presenting data.To put it in simpler terms, controls loaded in the RadXmlHttpPanel should not execute server-side events. For optimum performance, in many cases it is in fact possible to combine the best of two worlds by wrapping a RadAjaxPanel around RadXmlHttpPanel and take advantage of what each control does best. You can read more about the potential issues and reasons for this in the Troubleshooting article. The following example demonstrates how to benefit by using both of the controls together. Inside a RadXmlHttpPanel we place a RadGrid control, and the RadXmlHttpPanel itself is placed inside a RadAjaxPanel. The RadXmlHttpPanel is used to load content on demand in the RadGrid, and the RadAjaxPanel is used to modify (update) the content from the server. This way we take full advantage of both panels: no additional overhead when we load presentation data (RadXmlHttpPanel), and modify the content (only when needed) from the server using Ajax partial updates (RadAjaxPanel). <input id="txtSearch" type="text" onkeyup="SearchGrid(this)" onclick="SetCurrentIndex()"
<telerik:RadGrid RenderMode="Lightweight" ID="RadGrid1" OnNeedDataSource="RadGrid1_NeedDataSource" OnUpdateCommand="RadGrid1_UpdateCommand"
Width="97%" AllowSorting="True" PageSize="10" AllowPaging="True" AllowMultiRowSelection="True"
//TODO: Logic for updating the DataBase goes here. Dim contactName As String = "%" + txtSearch.Value + "%"
'TODO: Logic for updating the DataBase goes here. contactName = "%" + contactName + "%"